When news of the Korean War hit the streets across America in the summer of 1950, there wasn’t the rush to run down to your local recruitment station to sign up—not like the great patriotic appeal that had occurred just nine years earlier when Pearl Harbor had been attacked. America had just gotten over a war and had settled into a peri­od of prosperity; now another war, this one in some far-off Asian country was about to threaten that prosperity and equilibrium. And when people began to follow the news from another front, it wasn’t good. From the moment the first troops were sent to Korea from Japan, the once mighty military machine that had defeated Germany and Japan just five years before now found it­self literally on the run after being unable to halt the North Korean advance. First Osan, then Pyongtaek and Ch’onan fell. Names and places on a map that most Americans could not find but where American blood had been shed. The Inmin Gun juggernaut kept on advancing and rolling over everything in its way. It hadn’t even been called a war yet; Truman had called it a “police action” and the name stuck. An excerpt from War Remains. 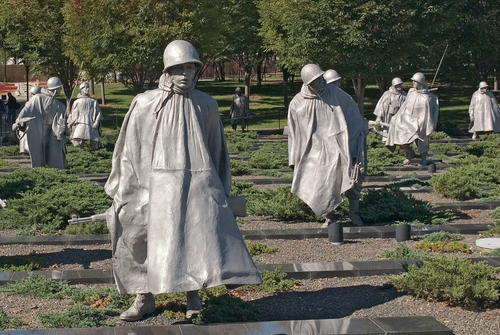 Today is the 61st anniversary of the start of the Korean War.